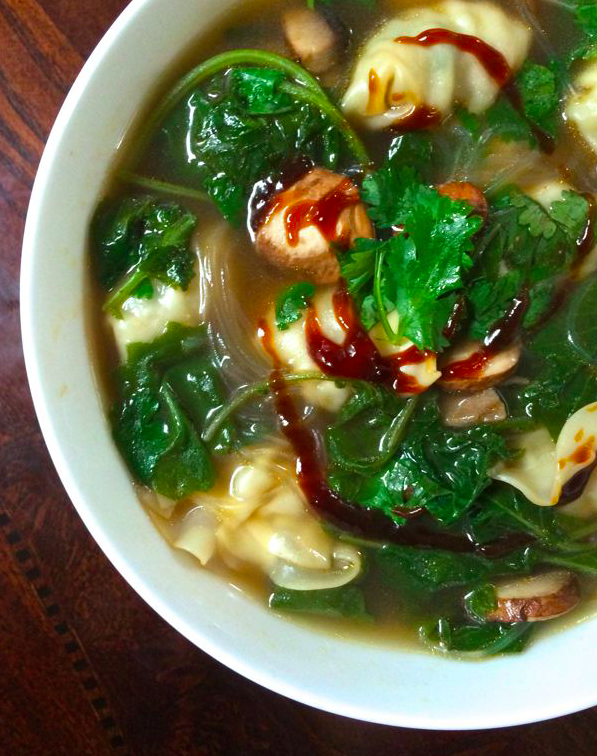 This 5-Minute Wonton Soup Is So Good You'll Lick The Bowl Clean! This 5-Minute Wonton Soup Is So Good You’ll Lick The Bowl Clean! For a light, delicious comfort food of Asian dumplings in a chicken-flavored broth that will soothe your insides, try this wonton soup that will deliver. It’s a simple recipe that takes only 5 minutes to prepare, cook and ready on your table for you to dive right in! It’s a simple recipe that uses frozen pre-made Asian potstickers from your local grocery store, mushrooms, Asian noodles, spinach and an Asian-inspired broth – all easy ingredients for an enjoyable and tasty experience. They can be served as an appetizer soup or as your main meal. If you prefer to make your own wonton potstickers then try this easy recipe, which can be a fun experience for you and your family or friends to help wrap, seal and you cook for a delicious soup! It’s so delicious it will get you licking your bowl clean! Bring chicken broth, soy sauce, rice vinegar, ginger, sesame oil and samba oelek chili paste (optional) to a boil in a large soup pot, whisking occasionally. Add frozen potstickers, mushrooms and baby kale or spinach to the boiling broth and simmer for 3 minutes until potstickers are warmed through and kale or spinach is wilted. Divide noodles between four bowls and cover with equal parts of the wonton soup. Garnish with a drizzle of hoisin sauce and fresh cilantro if you wish. More Asian Recipes? Try This Chinese ‘Buffet-Style’ Coconut Recipe Here, Or Watch How To Make Asian Honey Chicken!